Building on his first book released in 2003, Trails of the Wild Cabinets, author Dennis Nicholls now presents Trails of the Wild Selkirks: South of the Canadian Border, the second guide book published by Keokee Books. Nicholls hiked about 1,300 miles to research this book that covers more than 130 hikes. The Selkirk Mountains of northeastern Washington and northern Idaho hold a fantastic variety of landscapes from lush rain forests to dry grasslands to the cirques and granite of its high peaks. These wonderful wildlands also remain home to wildlife found almost nowhere else in the lower United States, including grizzly, woodland caribou, lynx and wolves. 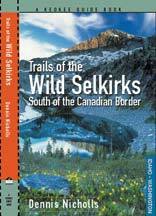 Trails of the Wild Selkirks sells for $16.50, is 336 pages long, and contains numerous photos and maps. It is available at area bookstores and other retailers; by phone at (208) 263-3573; or in the Sandpoint General Store at SandpointOnline.com.